And this time, I had a completely different kind of photo shoot. It was a lot of fun though. Noël has been my youngest model ever. 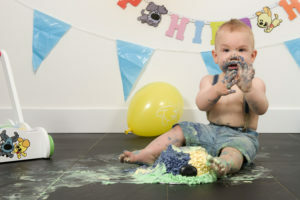 When his mom asked me if I could do a cake smash photo shoot I have to admit I really didn’t know what that was about. In my mind my inner child came above and I saw a lot of scenario’s about what people can do with cakes. Beside eating the cake of course. I needed Google to find out what cake smash really is about. And that looked cool and seemed to be a great photo challenge for me. Of course I said yes to her. I think that pushing your boundaries will give your creativity a big boost. And boy it did. 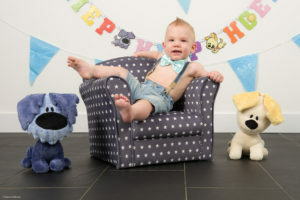 So I went to their home with my photography gear to and we built a mini studio setup there in the Woezel en Pip theme. Even the cake was in the Woezel en Pip outfit. I think this was a very beautiful cake. The cake was created by a fantastic cake artist Romana Ammerlaan. Check out her Facebook page Serge Romana Ammerlaan. The young Noël did a fantastic job as a model. 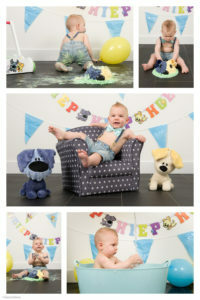 He is very photogenic and we all had a lot of fun during the shoot. 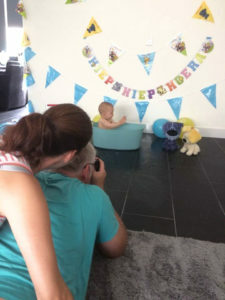 The ‘making of’ picture at the right was created by Noëls dad. Thank you for that. And check out Noël’s outfit. Short jeans with very cool braces and even a charming bow tie which matched the theme very well. After the cake smash it was time for a nice bath. That also was great fun. Talking about smashing and splashing … Noël did a fantastic job in the bath too. During this shoot I used two studio flashes with one stop difference in power. Both studio flashes had a translucent umbrella in order to create a evenly spreaded light so that Noël could move around while the light levels remained relatively stable. So thank you Noël for being such a fantastic model. You did a great job. And today, the day that I post this blog, Noël happens to be exactly one year old. How about that? Happy birthday Noël. Ik hope you and your mum and dad have a great day.